This miniature shelf speaker, introduced by Hobby HiFi as CC86 comprises Wavecor drivers. The kit contains the Wavecor TW030 WA01 textile dome tweeter and the WF118 WA02 paper coned bass driver. The frequency response absolute flat from 30 Hz (with subwoofer) to 30 kHz at +/- 1 dB; the waterfall spectrum is exemplary and the harmonic distortion is low. Considering these characteristics the Wavesat 118 is certainly one of the kits with outstanding price / performance ratio. 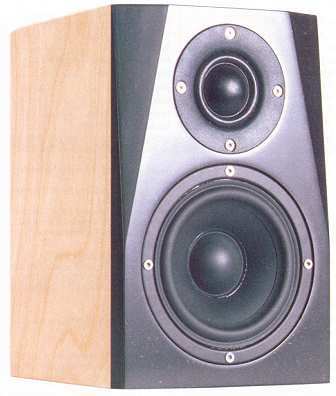 Listening test in conjunction with subwoofer Wavesub 178: ... "they really sound like grown-up floorstanders. Not only the low bass but also the completely seamless transition from sub to sat and the clarity and tightness of the bass captivates the audience. The Wavecor trio shapes an impressive and realistic stage, with musicians that perform within reach. The stage shows a remarkable depth and width where the players are positioned with absolute precision. Particularly amazing: the Oscar Peterson Trio with "We Get Requests", a legendary recording from 1964. Ray Brown plays crazy solos on his double bass, and the huge instrument is realistically placed far to the right just behind the baseline. The fact that the subwoofer is situated somewhere else is immaterial: it just cannot be located at all. It's the job of the sats to provide three-dimensionality. Sure, the soundstage collapses when the sub is switched-off. That's the fairly known psycho-acoustic effect: suddenly our brain has to imagine the bass and there is insufficient processing power left for simulating room conditions. The main reason for the incredible sound stage built by the sub / sat system is the extremely extended frequency range. The only thing that doesn't work is higher volumes. The law of physics cannot be fooled. Low bass at higher volumes requires long bass driver excursion, and they are limited. At moderate levels, however, this speaker team provides everything imaginable. - Wavecor WF118 WA02 bass driver. Please note: Our standard kit (above) contains already the metal oxide resistors of the high-end version as in Hobby HiFi. In line with the Hobby HiFi recommendation we suggest the following crossover components. The standard components are in italic. To those of you who wish to have an absolute top-class version we recommend the Wavesat High-End 2. The coil in the signal path is a cfc16 with 1.5 mH. All other components are the same as in the High-End version.